The latest 911 is superb. It’s beautifully engineered and supremely capable, and a properly involving experience for the driving enthusiast. It should be right at the top of anyone’s sports car short list. As is traditional with the 911, Porsche hasn’t overhauled the shape, so the familiar profile is all present and correct. But the 992 generation is wider than before, and for the first time the bodywork for the rear-wheel drive Carrera S and the four-wheel drive Carrera 4S is the same. The details have all been brought slap bang up to date, which means LED headlights and door handles that sit almost flush with the bodywork, and pop out when you unlock the car. The rear lights wrap around the back of the car. At launch, you can choose between the Carrera S and Carrera 4S, although expect plenty more variants to be released in the future. Both come with 20-inch alloy wheels at the front, and 21-inch wheels at the back. Standard colours are white, black, Guards Red or Racing Yellow, with others available as paid-for extras. The interior of the 911 has had more of a dramatic overhaul, and it feels suitably modern with some cutting-edge features. All the important stuff is great. The seats go nice and low, and the steering wheel has plenty of adjustment to mean you can get the ideal driving position. The gearstick is tiny (there’s no manual version yet), and only used to select drive, park or neutral – there’s no more using it to shift through the gears as an alternative to the wheel-mounted paddles – and the buttons around the centre console from the previous version are gone. This makes the cabin look tidier and more minimalistic, but does mean you have to navigate through a couple of screens on the infotainment system to change certain settings. Speaking of infotainment, there’s a touchscreen in the centre of the dashboard that is well organised and easy to use. There’s also a smaller screen on each side of a central tachometer. Most of the time, this displays a graphic reflecting the 911’s classic five-dial layout. It looks great, but its position behind the wheel means the view of it is obstructed, and you’ll have to weave your head from side-to-side to see everything. Build quality and materials are 95% great, although there are a few areas of plastic that don’t quite have the feeling of robustness found elsewhere. The 911 is rather compact, so it’s not exactly roomy inside, but there are some features added in to help everyday usability. As the 911 is rear-engined, there’s space under the bonnet for a couple of weekend bags, but don’t expect to be able to fit big suitcases in. The rear seats can be used for storage too, as they’re too small for adults. You might be able to fit small children in there, though. There’s a rather inelegant cupholder in the centre console, which can be switched out for a generic cubbyhole, and another cupholder that emerges from the dashboard for the passenger. There are some small door pockets, and a glovebox. The 911 is renowned as a keen driver’s car, which means it needs to be capable, while also providing feedback and entertainment. Porsche has long been expert at doing this, and so the tweaks to the 992-generation 911 are relatively minimal. All cars come with an adaptive suspension system as standard, and if you raid the options list, you can have all sorts of other clever stuff to make your car whip around corners even faster, such as active anti-roll bars, active engine mounts and rear-wheel steering. The car we drove was a Carrera 4S loaded up with the lot. The good news for those that spec these options is that they make for a sublime experience. The grip levels are immense, and the feeling of precision and control is as good as it gets. The car stays flat around the bends, but the suspension is supple enough not to get unsettled even in the stiffer Sport mode, and it’s perfectly comfortable at a cruise, too. The steering is beautifully weighted to be hefty but not heavy, and there’s plenty of tactile feedback both through the wheel and through the seat. All of this together inspires confidence in the car very quickly. If there’s any criticism to be levelled (and it's a very minor one), it’s that the car is so well behaved, capable and confident, that it can sometimes mask the feeling of speed, so you might find yourself going unexpectedly fast. The 911 feels so safe at higher speeds that 60mph feels pretty slow. It’s still engaging to drive at lower speeds, though. 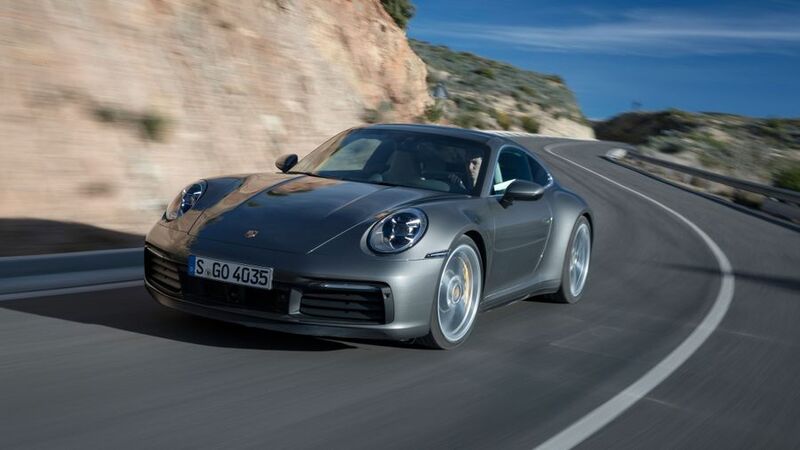 The latest 911 retains a turbocharged, 3.0-litre flat-six engine that makes 450 horsepower, which is 30 horsepower more than the previous car. It’s a gorgeous piece of engineering, with plenty of low-down grunt, which means you don’t need to flick around through the gears in search of peak power. Throttle response is rapid all the time, but if you’ve got the optional Sport Chrono pack then you can select Sport or Sport Plus, which sharpens the response still further. Gears are shifted via an eight-speed, dual-clutch automatic gearbox which is super-fast and smooth, even in Normal mode. There’s no manual gearbox available at launch, although one is due to follow. There’s no hiding away from the fact that the 911 isn’t cheap. A less powerful Carrera and Carrera 4 will follow in time, but for now the Carrera S and Carrera 4S will be up against rivals like the Mercedes-Benz AMG GT, both of which have more power than the Porsche. We don’t yet have the industry estimates for the new 911’s resale value, but based on the last model, we’d expect to be pretty good. The Porsche’s engine is also efficient for this type of performance, which will reduce fuel bills compared to rivals, and while servicing, maintenance and repair is likely to be pricey, we’d expect overall running costs to be better than the Jag or the Mercedes. Porsche doesn’t have a particularly great record for reliability, although the company's relatively small size in the automotive market means it’s often absent from the larger reliability surveys, which makes it difficult to get meaningful insight into the 911, specifically. Warranty Direct’s Reliability Index ranks Porsche close to the bottom of all the manufacturers, although owner reviews for the previous generation 911 on Auto Trader don’t show any particular issues. Should anything go wrong, Porsche offers a three-year, unlimited mileage warranty. The 911 doesn’t sell in large enough numbers to be crash-tested by safety organisation Euro NCAP. One of its features is what Porsche says is the first Wet mode, which detects water on the road and adjusts various settings at the press of a button. Automatic emergency braking is included as standard and can detect other vehicles, pedestrians and cyclists. Night vision is available as an option to improve visibility in the dark. An Isofix child seat mounting point is fitted to the front passenger seats. Six airbags are also included. The 911 has a decent amount of equipment as standard, including several colours of leather interior, electric sports seats that adjust in four different ways, and two-zone climate control air conditioning. Porsche Active Suspension Management (PASM) is standard, which adjusts the stiffness of the car’s dampers in reaction to conditions, and you also get satellite navigation, a wifi hotspot and a DAB digital radio. There are plenty of options boxes you can tick as well, including some for features that are included in much cheaper cars. Options include a range of seats with different levels of adjustability, as well as several bodykit tweaks for a slightly different look. Adaptive cruise control is extra, as is a sports exhaust and various handling features including rear-wheel steering, a more advanced power steering system and the Sport Chrono pack. You can also specify more powerful carbon ceramic brakes. In short, be prepared to budget a fair bit extra for options. The 911 is a sports car icon, and the latest version further improves on an already great car. It’s got incredible ability and unrivalled brand heritage, but it’s also well-built and comfortable. It’s the benchmark other manufacturers need to aim for.